Once you’ve imported your image and perhaps added some interactive elements and a skin, you can then open the Output panel to export the project in the Flash format. Return to Horizon – Brings the panorama’s center perspective (horizon) back into view after it has been manually moved upwards or downwards. A value of 0 will equate to no return, and an increase in the value will return the image to the horizon at a quicker speed. Start after fully loaded – Select to have auto rotation begin only after the panorama has been fully loaded. If left disabled, the panorama will rotate while it is being downloaded. Change Node – Pro - If you have a tour, you can select this option to automatically change the nodes in a tour, every n seconds. The panoramas will change according to their order in the Tour Browser, which you can change to suit the tour’s story or flow. Random – Select to randomly change the nodes. When building a tour, you can add transitions to your project to create smooth changes from one image to the next. You can choose to transition between panoramas or the sound or both. ✭ Learn how to add transitions to your tour. Dip to Color - Use the color picker to the right to choose a color to dip to. Transition Time – The full time of the transition from one panorama to the next. The default is 1 second. Effects – You can choose to have effects occur before and/or after the transition. The current effects are Zoom In and Zoom Out. Wait for transition - When selected, the After transition effect, will not occur until the transition is finished. When deselected, the effect will occur at the same time as the transition. Zoomed FoV – This value will determine how far the panorama will zoom in. The default value is 20.00 degrees. Zoom Speed – The speed of the zoom effect. A hotspot text box appears when a mouse hovers over a hotspot (tooltip). Select to activate its settings below. Size – Set the size of the text box for the hotspot. Text – Set the text settings. Color - Select the color of the text by clicking on the color well. The default is black. Word Wrap - When selected the text will wrap to the next line. Background – Set the text box’s background color. Visible - Select to show the background of the text box. When not selected, no background will be seen. Color - Click to choose the color of the background. Border – Set the text box’s border. Visible - Select to show the box’s border. When not selected, no border will be seen. Color - Click to choose the color of the border. Radius - The radius (roundness) of the box’s border. Increase the number for a round rectangle or eventually a circle. If you’ve added polygon hotspots, then these settings will affect how they appear in this Flash output. Always Hidden - The hotspots will be active, but not highlighted. Always Visible - The hotspots will always be active and visible (see background and border colors). Show Current - The hotspot will only be visible when the mouse enters the active area. Show All - All polygon hotspots will be visible when the mouse enters the active area of one hotspot. Disable - Disable the background and border for the hotspots. 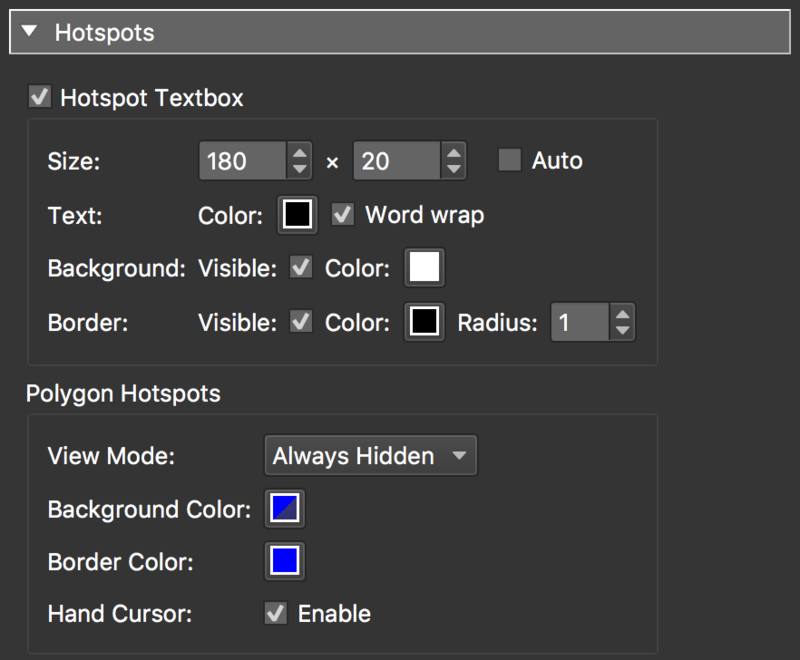 Background Color – Choose the fill color of the hotspot. Border Color – Choose the border color. Template – Choose a template and then click the Edit Template button to open the template settings. Scaling – Choose how the panorama and skin will scale within the player. With Window - The panorama will maintain its aspect ratio when the window’s size changes. The skin will not scale. window. No border is seen and aspect ratio is not maintained. No Border - The panorama will take on the window’s dimensions maintaining the aspect ratio, yet no borders are visible. None - The panorama will not scale. Avoid visible background – Available for Flat images only – Select to ensure no background is visible when changing the window size. Frame Rate – Adjust the frame rate of the panorama. ✭ Tip: A smaller frame rate can reduce the processing needed on the clients machine. This can be helpful if you have several panoramas on one page. Motion – Adjust the motion quality of the panorama while it moves. Change Stage Quality: Keep this option selected if the panoramic image does not include elements on the Flash stage (i.e. vector based controller, your own loading bar, etc.). When this option is not selected it helps to eliminate the jagged lines that appear with elements in the image during movement. Change bitmap filtering: Same as above but has an effect only on the panorama and not the whole stage. Show during movement – When selected, the mouse pointer will turn into a bull’s eye and directional arrows when the panorama moves. Show during idle – When selected, mouse will stay visible when the panorama is not spinning. Custom Cursor Image – Import your custom made cursor here. Check out information on cursors. Mouse Wheel – Select to disable the mouse wheel in the browser. panorama only to specified domains. Domain - Enter the domain to which the panorama can only belong. Separate multiple domains with a comma: www.gg-sw.com, www.nytimes.com. Message - Insert a message that appears if the panorama is displayed in a domain other than what is listed in Domain. Enable expire date – Here you can add an expiration date of the visibility of the panorama. Last Day - Choose an end or expiration date. Date Message - Insert a message that will appear when a user tries to access the panorama after the expiration date. Local Security – Use this option to choose to have Flash access a network or the local disk. Allow network access - Select to enable Flash to communicate with another website. When selected, Flash will not be given access to the local disk. When not selected, Flash can only access the local disk and will not have access to a network. Hide ‘About Pano2VR’ – pro - Select to hide the About Pano2VR menu item from Flash’s right-click menu. Text: Enter the text for the linked menu item. URL: Enter the URL for the Linked Text above. Sensitivity – Set the panorama’s sensitivity to the movement of the mouse. A low sensitivity will cause the panorama to move slowly with the mouse’s movement. Inertia – When enabled, the panorama will gradually pick up speed when rotating and likewise, it will slow before coming to a stop. Disable - Select to disable interactivity via a mouse. Invert Control - Select this to invert the mouse control. When inverted, dragging the panorama with the mouse will drag in the same direction as the mouse. Also, to move the panorama, the user must click and drag (like Google Street View). Mouse Wheel – Mouse wheel control. Disable - Select to disable interactivity via the mouse wheel. Invert - Select to invert the direction of movement initiated by the mouse wheel. Speed - Enter the speed of the movement when initiated by the mouse wheel. Increase the number for faster control and lower the number for slower control. Disable - Select to disable keyboard control. Disable zoom - Select to disable zooming with the keyboard (shift key). Level Tile Size – This determines the size of the sub tiles in pixels. Filename – This determines the file location and naming convention of the generated sub tiles. You may change the name to suit your project, although the system placeholders must be used so Pano2VR knows which tiles to use. Levels – Set the levels of resolution either automatically (Auto) or manually (Manual). When Auto is chosen, Pano2VR will automatically set the levels based on the calculation chosen in the program’s settings (Preferences/Settings > Advanced > Output > Use width/Pi as output factor). When Manual is chosen, you can enter the level size yourself. In the table that appears, double-click in the empty field, and the first level is added. You can change this value or keep it. Click the plus sign or double-click the field below to add a another level. Externalize – Select, Embed Images, to keep the images out of the SWF and called externally from the Images folder. Once selected, the following options will be made available. Interlacing – Select this option to use progressive JPEGs. Image Names – This creates a folder to hold the cube face images. Or you can choose your own folder or location by clicking, Open…. The default is images/$n_o.jpg. Images is what the folder will be named. $n is a placeholder that will be replaced by the image’s name. o simply stands for output and can be removed or changed according to your needs. Face Names – Choose a naming convention for the cube faces. The naming convention will be appended to the file name displayed in the Image Names text field. Type – Choose the type of download preview image: Grayscale, Color or Sepia. When None is chosen, no preview image is used during download. Rather, only a background color is shown (color-picker). FoV Mode – This setting ensures that image boundaries stay true to the image’s window or scaling option. When the window size is changed, the image is scaled accordingly. Vertical - When the image is scaled or window resized, the vertical field of view will stay true. Horizontal - Choose this option to ensure the horizontal field of view is most important and is always visible when scaling the image. Diagonal - If the diagonal of the image is most important and should stay within the image’s frame, choose this option. Max - When this option is chosen, whichever dimension is greatest (vertical or horizontal) will stay within the field of view when the image is scaled. Externalize – Select Skin images, to have all the images used in the skin externally called so they are note embedded in the outputted SWF. Image Output Path – This creates a folder to contain the images of the skin and by default is placed in the same location as the panorama. The default is the same folder as the default folder (images) that holds the cube face images. Clicking folder icon will let you choose a specific location. Clear - Clears the folder location. Edit - Edit folder name. Show in Finder/Explorer - Locate the folder. File – This is where your output will be located. The default is to output the file in the same folder as the original image. If no change is made here, this is where you will find your outputted image. Filename – This determines the file location and naming convention of the generated sub tiles. You may change the name to suit your project although the multiresolution placeholders must be used so Pano2VR knows which tiles to use. Overlap – Keep selected to have the tiles overlap by one pixel to avoid visible seams in the image. If using tiles from a source other than Pano2VR, this option may need to be deselected for correct tile alignment. Switch Bias – Changing this setting will determine at which zoom levels the tiles will change. The higher the number, the sooner the tiles will change. If this is set too high it will require much more processing (downloading and decoding) for the host computer. A good compromise setting is between 0.4 and 0.5. Bias = -1 – A negative setting will change the tiles when there are 4 image pixels to 1 screen pixel. Zooming in will cause the visible tiles to change just before there are 4 image pixels to 1 screen pixel. Zooming out, the tile will change just before there are 2 image pixels to 1 screen pixel. Bias = 1 – A high bias number will change the tiles sooner and will produce aliasing, and will increase processing load. Zooming in will cause the visible tiles to change just before there is 1 image pixel to 1 screen pixel. Zooming out will change the tiles just before there is 0.5 image pixel to 1 screen pixel. Bias = 0 – Zooming in will cause the visible tiles to change just before there is 1 image pixel to 2 screen pixels. Zooming out will change the tiles just before there is 1 image pixel to 1 screen pixel. Raw Image Memory – Set how much memory will be used by the host computer for downloading tiles. Leave at the default if the host computer has limited memory. Bitmap Memory – This sets how much memory will be used by the host computer to store the decoded bitmap tiles. Leave at the default if the host computer has limited memory. Download Queue Size – This determines how many tiles are downloaded from the server at one time. Leave at the default (20 tiles) for optimum performance. Decode Queue Size – This determines how many tiles are decoded to bitmap at a time. Changing this setting may affect the performance of the host computer. Tile size affects this setting. If the host computer is stuttering when trying to show the tiles, try increasing the queue size if the tiles are small or trying lowering if the tiles are large. Generally, the default should work well for most projects. The following settings are for the multiresoltion levels. The division of the levels is determined by the settings in the Pano2VR settings/preferences. Number of loaded levels at startup – Set the number of levels that will be loaded when the player is first opened. Number of embedded levels at startup – Set the number of levels that will be embedded in the SWF. Number of decoded levels at startup – Set the number of levels to be decoded when the player is first opened.